The Inspiration: I have always been fascinated with the Titanic story: the unsinkable ship tragically lost on its maiden voyage across the Atlantic Ocean a hundred years ago on April 15th, 1912. In 2008 I went to see a Titanic exhibit in Toronto with friends, and my interest was further captured by how the exhibit showed what life was like onboard the ship. How passengers dressed, entertained themselves, slept and, of course, ate. 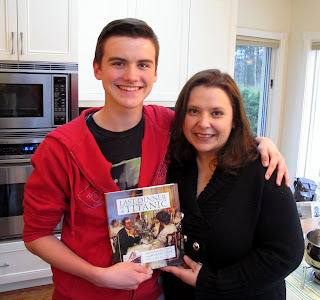 In the exhibit’s gift shop we found the cookbook “Last Dinner on the Titanic”, which I bought, and which, after looking through it, agreed with my friends (Jake & Suzanne and their kids Jasmine & Ryan) who’d accompanied me to the exhibit that we needed to recreate our own Titanic dinner. We planned the menu, set a date, and a couple of months later had our first Titanic dinner from the Second Class menu in the cookbook. We dressed up in period costume, Suzanne & Jasmine decorated their home and table beautifully while Jake, Ryan and I cooked. It was wonderful night and we couldn’t wait for the next one… and the next. The Project: I knew for the 100th anniversary that I wanted to commemorate the event by recreating the entire First Class menu as it was served the night the Titanic hit the iceberg and sank. Using the book as a guide, I planned to recreate each dish and blog about the journey. The project culminated in hosting my own Titanic dinner featuring 11 courses of my favourite menu items. It was a daunting task, but I was up to the challenge and it became a labour of love for me. 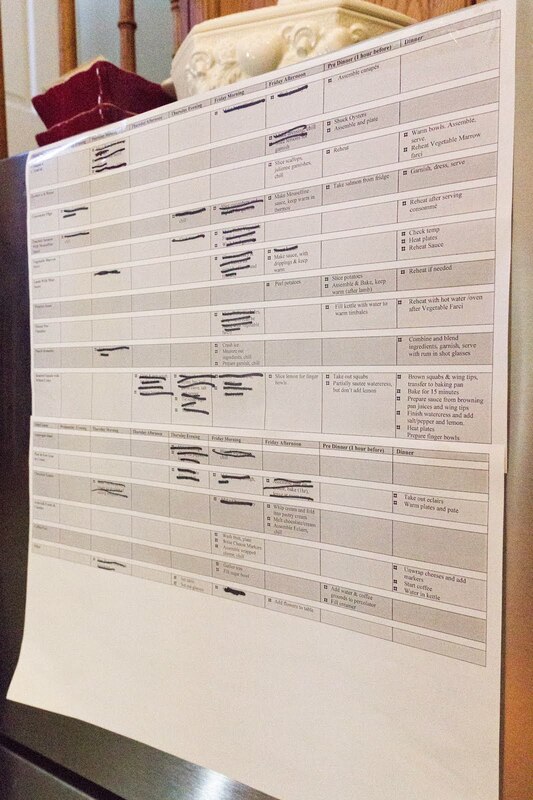 The Plan: The key to pulling off an 11-course dinner is planning, organization and help. 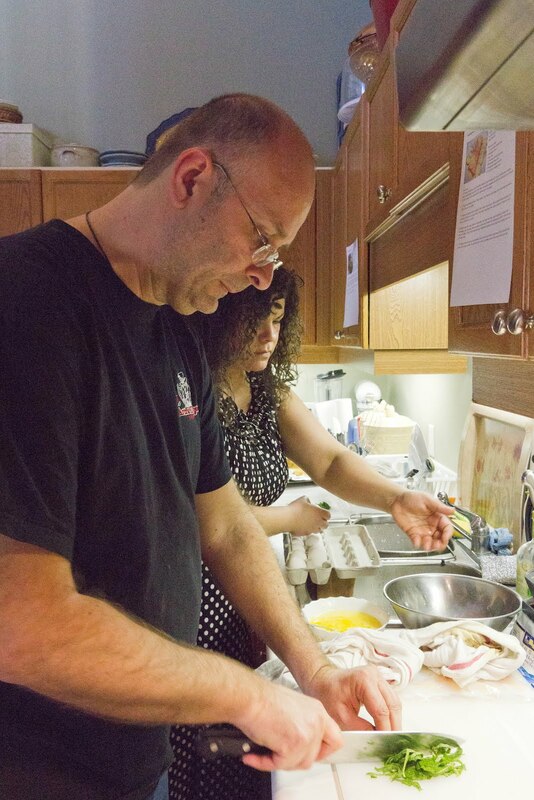 As I recreated each dish, I would make notes on how I would prepare the dish for the dinner. Notes such as what could be done ahead of time, timing on finishing the dish, plating and garnishes, etc. 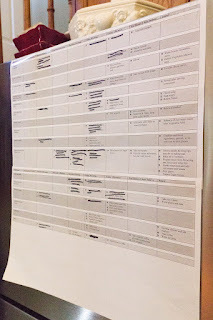 The result was a chart containing all the dishes with blocks of time starting two days before the dinner. In between were the tasks for preparing and plating each dish. As tasks were completed, they were crossed off so we could tell our progress with one glance. I was teased a little about the chart and I understand it may seem a little over the top, but for me it was the only way to make sure everything was completed. Organization is also important. I had lists for ingredients, linens, dishes, stemware and cutlery. 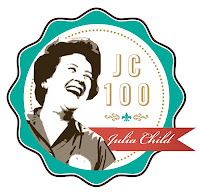 For a dinner 100 years in the making, I didn’t want to miss a thing. There is NO way I could have pulled this dinner together without help — it would have been impossible. I had the best ‘sous chef’, Peter Minakis of www.kalofagas.ca. He helped with the shopping, cooking, serving — and most importantly — keeping me calm and laughing. I also had help from my dear friend, Rossy Earle, who came early to help with the finishing touches and some expert plating. The Scene: I decided early on that I wanted the dinner to be all about the food. So instead of trying to recreate the 1912 era in my dining room, I went with modern elegance. Crisp linens, white dishes, sparkling glassware, silver candle holders and red roses. 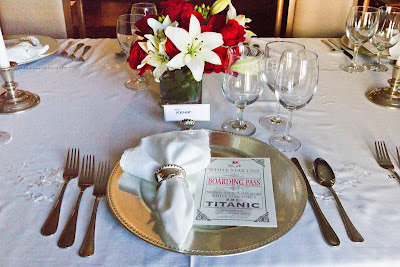 Each place setting had a silver charger topped with a white embroidered napkin and a boarding pass. 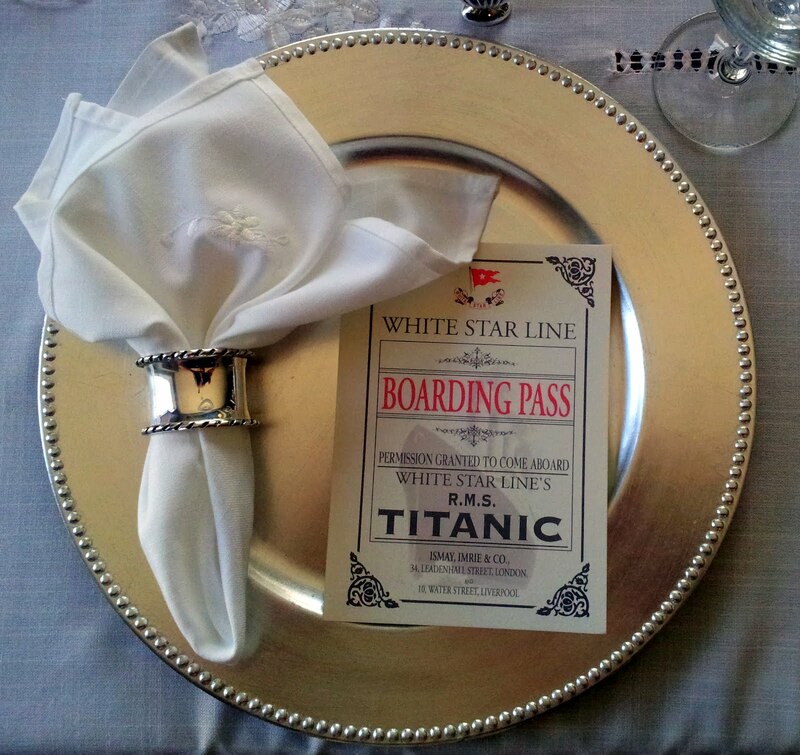 The boarding pass was a replica of the one issued to Titanic passengers. On the back of the boarding pass was the menu. I wanted my guests to have these as a reminder of the evening. 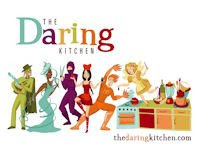 I chose guests who were fun, lively food enthusiasts, had adventurous palates, and most importantly were my friends. They brought magic to the evening and it was a pleasure to have them. I asked my guests not dress formally or in period costumes, but to dress nicely, befitting an 11-course dinner. I wanted them to be comfortable. There was joking talk of stretchy pants and formal muumuus, but everyone dressed to impress. During the dinner we set the mood with candlelight and period music compiled by Ryan for the evening. The Wine: My guests provided the wine for the dinner. 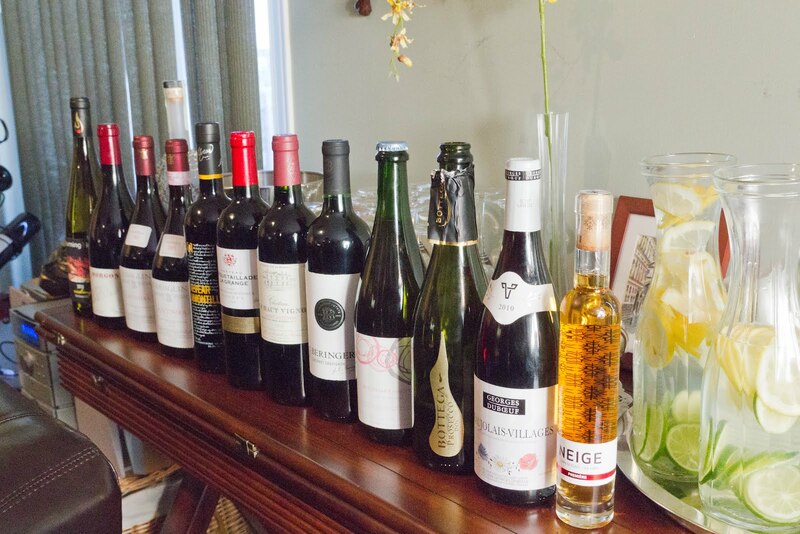 I gave them the types of wines recommended in the book for each course, and they did a fantastic job of choosing impressive wines for each dish. We finished the evening with a special bottle of Port that my father had given me years ago and I saved for this dinner. The Evening: We started the evening with some Prosecco and the first course: Hors d'Oeuvres. This consisted of two dishes, the first being Oysters a la Russe, served on a bed of ice capped with a piece of an actual iceberg, provided by my friend Andrew. How cool is that?! The oysters were served with lemon and a spicy relish. 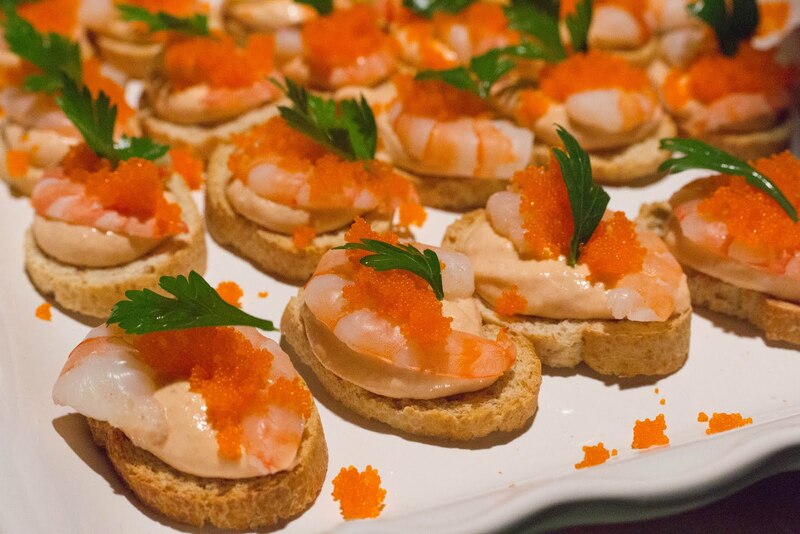 The second Hors d'Oeuvre was Canapes a l'Amiral: crostini topped with an amazing shrimp butter, poached shrimp, fish roe and parsley. 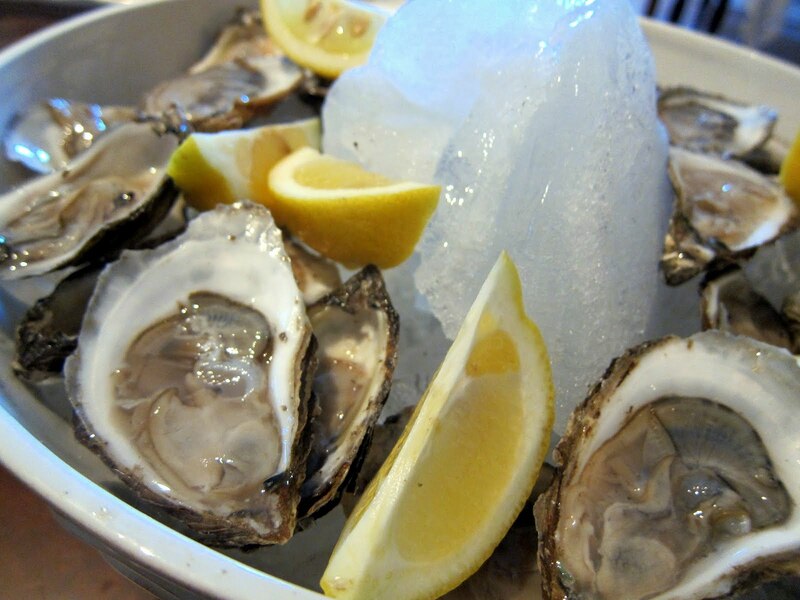 These were one-bite wonders that belong on any elegant menu. 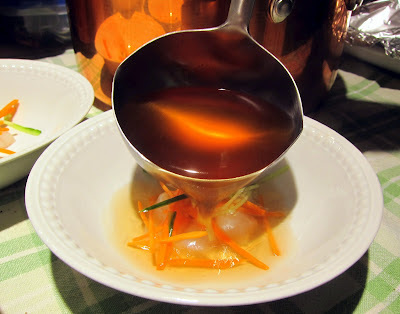 The second course was a perfectly clear Consommé Olga made with veal and beef broth. The hot consommé was poured over thin slices of raw scallops and julienned cucumber and carrots. The heat of the consommé perfectly cooked the scallops and vegetables. 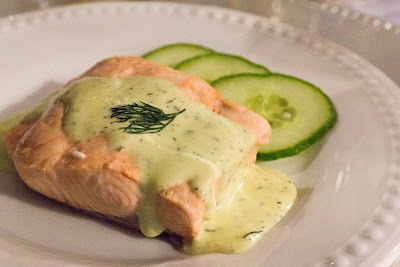 The third course was a room temperature poached salmon topped with a Mousseline sauce that is similar to Hollandaise, but includes a little whipped cream and chopped dill. The salmon was poached for about four minutes so it was still a little rare in the middle. A simple garnish of sliced cucumber added a subtle flavour and texture to this delicate dish. 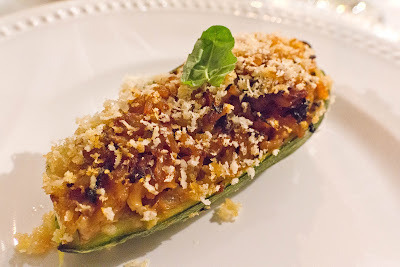 For the fourth course we had Vegetable Marrow Farci. Vegetable Marrow is in the zucchini family and its taste is a cross between a cucumber and zucchini. Each vegetable marrow is halved, hollowed out and filled with a delicious mix of mushrooms, rice and herbs. I topped them with panko and grated Parmesan cheese. 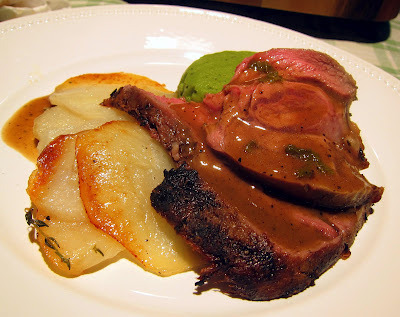 The fifth course was Roasted Lamb with Mint Sauce served with Minted Pea Timbales and Potatoes Anna. The lamb was roasted to medium on the bone with a marinade of rosemary, garlic and mustard. All the meat was carved off the lamb bone but one guest wanted the little bits clinging to it. Now that is an adventurous eater! Made me proud. The Minted Pea Timbales brought out a nice sweetness in the lamb. The Potatoes Anna had a crispy top layer with soft center layers scented with thyme. 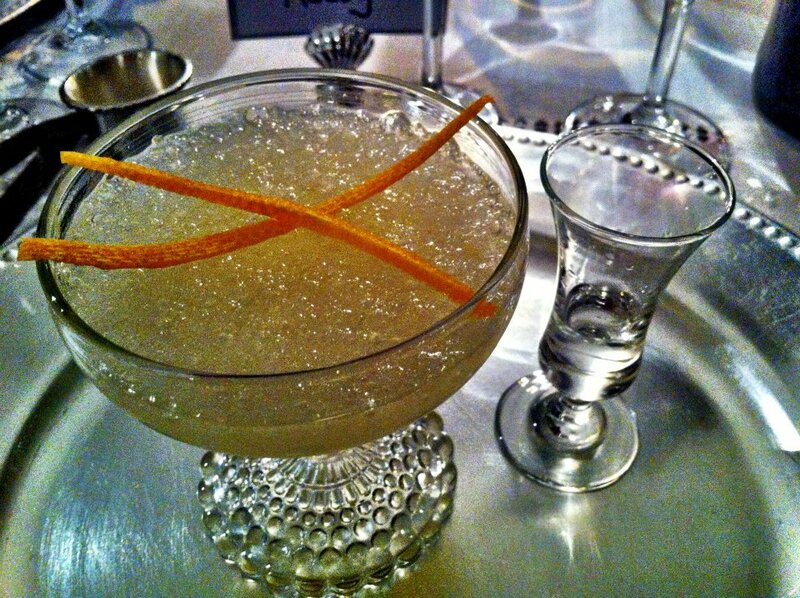 Next was the sixth course, a refreshing yet boozy palate cleanser called Punch Romaine, which combined Prosecco, white wine, lemon juice, orange juice, simple syrup and crushed ice. It has the consistency of a slushie and I just adore this drink. 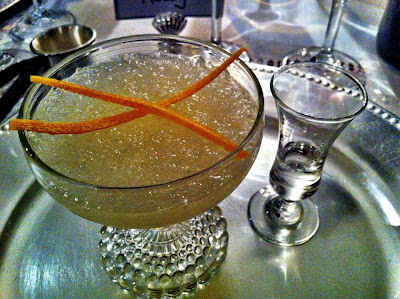 Garnished with slivered orange rind, I served it with a little shot glass of white rum on the side. I wanted my guests to have the option to add as much or as little rum as they wanted. The seventh course was the main dish: the roast. For this course I served Roasted Squab with Wilted Cress. 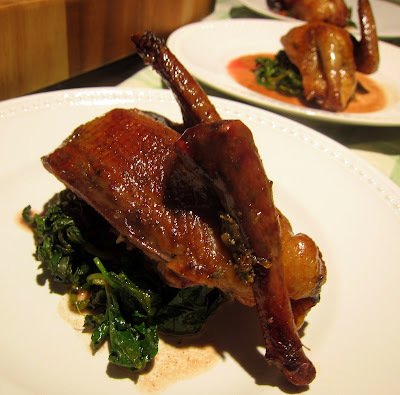 I roasted the squab to medium (much like you would roast a duck), halved each bird and removed the backbone. I served it on a bed of bitter wilted cress that was cooked with walnut oil, lemon and garlic. The sauce was a combination of Madeira, red wine and chicken stock. It was light and sweet and complimented both the squab and the wilted cress. Squab can be finicky to eat with a knife and fork so I encouraged my guests to eat with their fingers and provided little bowls of warm water with a slice of lemon to help them clean up afterwards. The eighth course was the salad course, which was always served after the roast: Asparagus Salad with Champagne Saffron Vinaigrette. 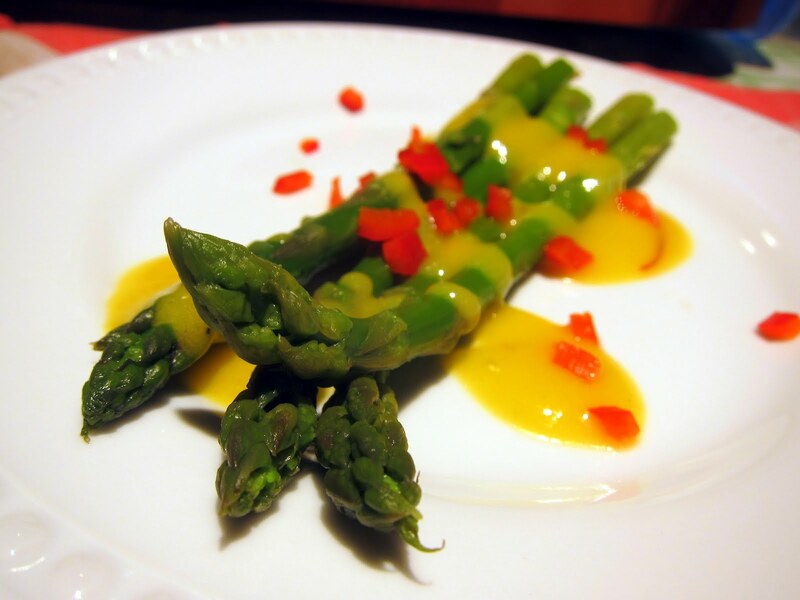 The asparagus was cooked until tender and cooled. I love the sharpness and colour of this vinaigrette. It comes alive on the plate and in your mouth. It is one of my favourite dressings to make. The ninth course was the Pâté de Foie Gras en Croûte. This dish did not have a recipe in the book, so I researched and experimented and came up with my own. It has an amazingly delicate pastry surrounding a mix of veal, pork, spices, dried cherries, almonds, herbs and foie gras. 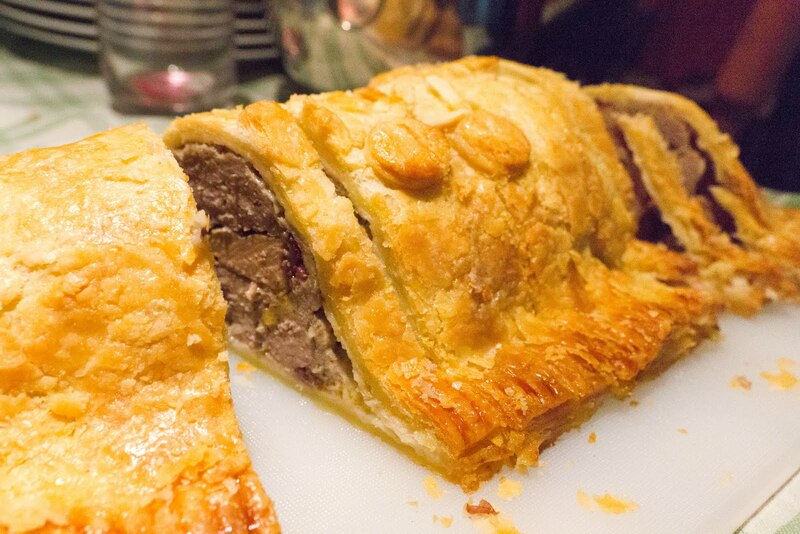 I prefer this dish at room temperature rather than cold, so I baked the pâté in the afternoon and let it sit until serving. It was a favourite among the guests and is so darn beautiful to look at, too. The tenth course was the Sweets course and from the three options on the menu the Chocolate Painted Éclairs with French Vanilla Cream were by far the best. 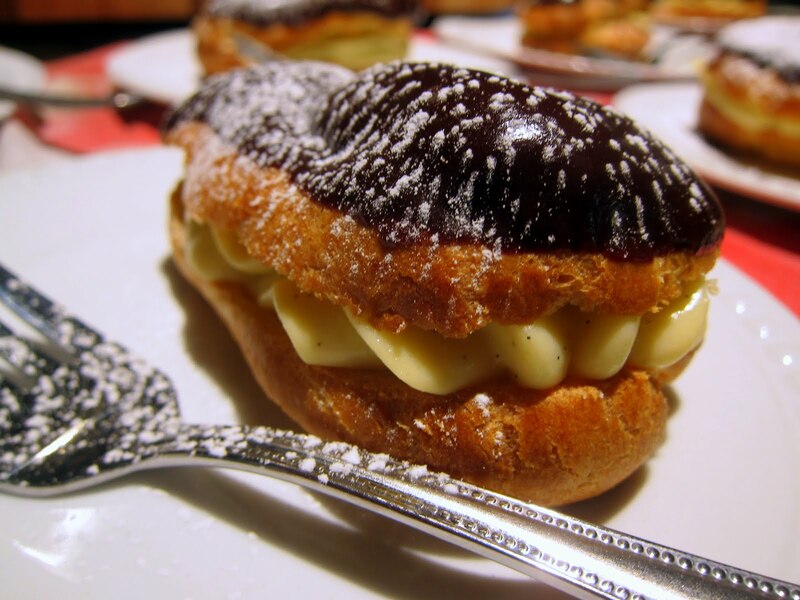 Perfect, golden choux pastry topped with dark chocolate and filled with a French Vanilla cream — what’s not to love? I dusted these darlings with some powdered sugar and watched them be devoured by my guests. Even after 10 courses, they wanted seconds of these éclairs. Good thing I had made plenty. The eleventh course was a cheese board with fruit. I chose cheeses that they served on the Titanic: Edam, Camembert, Roquefort, Gorgonzola and Cheddar. The fruit was simple: grapes, blueberries, strawberries, mandarin oranges and sliced pears. 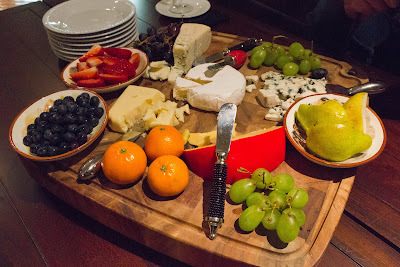 Each fruit specifically complemented one of the cheeses, but my guests enjoyed mixing and matching the flavours. The Ending: We ended the evening around my living room coffee table, sipping Port, enjoying chocolate cigars, Turkish coffee and each other’s company. When asked how I felt now that the dinner was over, I got a little emotional and said that I was happy. The project’s journey led me to this one magical night filled with good food, fine wine, laughs, sighs and great friends. It was the perfect ending. Thank you Peter, Rossy, Sherry, Neeraj, Bev & Renee for the beautiful photos used in this post. For more photos of the evening, enjoy this slide show. This process from beginning to end is a labour of love Paula just as you mentioned. You deserve all the accolades, press and praise that has come your way This was a monumental task and you pulled it off with finesse.We all wish we were there sharing this moment with you. Oh yes, I would love to have been there, sounds absolutely wonderful, but I cannot imagine a) how long it took you to eat and b) how your guests managed to eat it all. This is so fantastic! You have inspired me; I'm creating a "sampling" from the menu for my son (9 years old) who is an avid Titanic fanatic to commemorate tonight's anniversary. Thank you so much for posting your lovely pictures and step by step instructions! So amazing! No one does an extravagant theme dinner like the Dragon! wow! Hats off to you for an epic effort! I have been wanting to do this for a while but had been very sick and missed the 100th year...but as you don't want to be bored to death with excuses....I will be attempting to do a similar thing for my Hubby for our wedding anniversary to be shared with a few friends. I hope you don't mind if I steal a few of the presentation ideas.